Ever since a cosmic phone call brought the four literal young goddesses Belldandy, Urd, Skuld - and, like an occasional vowel, Peorth - to live in college student Keiichi's residence, his personal life has been turned upside down, sideways, and sometimes even into strange dimensions! As the Parent-Child Showdown between Keiichi and his fa-um, "Keima-san," races its way along the night roads of the Inokuradai Circuit, his mo-uh, "Takano-san," passes the time by whupping the Goddesses at mahjong. But does she realize what they really are? Then, cry "Roadtrip!" and let Chihiro's Mini Cooper slip into gear, as she, Bell, and Keiichi hit the highway to a hot springs. But the vacation from drama is brief - and readers are advised to prepare for the advent of... the Fifth Goddess! 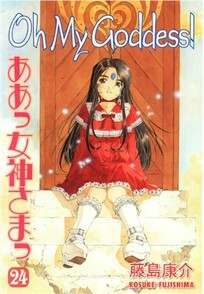 Story and art by Kosuke Fujishima.